Growth. Change. Maturity. Regardless of context, each of these words carries some amount of familiar pain. IT processes are matured generationally. That is to say that a process is designed, implemented, and then improved upon continuously. How rapidly an organization can identify process improvement areas and execute those improvements is a crucial factor in the success of the organization. Manual processes suffer greatly from what Gartner has coined as "human latency" or, simply put, the amount of time it takes for someone to figure out what to do. ITPA tools offer an ideal solution to human latency by automating tasks that previously might have been deemed un-automatable by traditional means. To refresh, ITPA tools exist today that can help your organization realize fully automated end-to-end IT processes. Implementing and taking advantage of these tools is easily accomplished; however, to gain maximum return on investment (ROI), you'll need to ensure that the IT processes being automated are fully mature. In the previous chapter, we covered several process-improvement and maturity-focused tools to assist you, including CMM, COBIT, the Double Diamond design process, and Six Sigma. This chapter will identify high-impact areas for automation, pointing out both the quick-win scenarios and areas that can be established and matured over multiple generations to build a best-in-class, automated, IT infrastructure. As we examine the top pain points in this chapter, it will become clear that each of these areas of "pain" can be correlated back to an accompanying strategic driver. Efficiency, agility, and compliance are drivers that have been hewn into the bedrock of IT management. We simply must accomplish our goals in these areas. Now, as we examine the top pain points, we'll explore how the failure to meet these goals has caused "pain" and we will more clearly see the need for ITPA today. The business needs of the line of business units do not always directly align with the business needs of IT. Balancing the tension between the line of business desires to develop new product and service offerings and IT's own desire to reduce the complexity and cost of the IT infrastructure is a challenge that requires a great deal of strategic and focused leadership. Each of these areas depends upon processes and, far often than not, these processes are highly human dependant, prone to error and misinterpretation, and difficult to control. As your line of business operations partners work to achieve their goals, they will demand rapid implementation of their new initiatives. In a globalized economy, the ability for an organization to deliver a specified product or service today is often not as big a foothold as one might think. Consumers demand organizations that can deliver "right now," and in today's fast-paced environment of rapid innovation and shortened times to market, a business must be able to keep pace with change. Trying to protect the corporate investment in IT infrastructure is a challenge and as an IT executive you must ensure that your infrastructure growth can be properly managed and supported. Demanding sufficient project management controls to ensure new systems align with the overall IT strategy and are manageable and supportable is critical to success, but this will only address part of the overall problem. Reduce the time to market for new initiatives through reduction in IT process time for new initiatives (hardware/software approval, provisioning, change management, configuration management, and release management). The focus is on delivery of a new product and service to a consumer in a quick and inexpensive manner, and IT project management and service delivery management are both major contributors to both cost and time. Don't underestimate the role ITPA can have in reducing project cost and ongoing support costs for your business partners. Increase transactions per Full Time Employee (FTE) by increasing IT availability through the reduction of incident management, problem management, release management, and business continuity IT process timelines. Establish clear service level expectations with line of business partners that are focused on the needs of the business (IT service management). Impacts in any of these key areas can spell real challenges for meeting IT business goals. Fully articulating and communicating IT business goals to line of business partners isn't where a CIO needs to be focusing time; the best place to focus is in driving IT service delivery that aligns to the business goals of the line of business partners being supported. This goal is obtainable through the leveraging of industry best practices, such as ITIL, and ITPA tools to automate the delivery of service. The ITIL framework and associated best practices will help you organize your infrastructure and ITPA tools will deliver the horsepower to get ITIL done. IT Service Management (ITSM) refers to the high-level discipline of managing IT service and delivery to a customer. ITIL, as you'll recall from Chapter 2, is one of the commonly used frameworks for ITSM, along with COBIT and several others. ITIL is being embraced by organizations around the world with a desire to standardize and drive out process maturity for their IT processes and really stands out as best in breed as an ITSM framework because of the perspective it delivers IT managers. ITIL is just broad enough to avoid granularly dictating an IT organization's finest details while still providing clear lines of departure between IT process disciplines. ITIL is not a new concept nor was it unique when it was originally created and the questions it has been designed to help address are nearly as old as technology's use in business. As early as the 1970s, IT managers were recognizing a need for an organized and systematic approach to ITSM. In his 1974 book Managing the Data Resource Function, Richard L. Nolan set forth what is essentially the foundation of ITSM when he began to identify the need for a management focus centered on what managers at the time referred to as the data resource "function." Today, that function is the nerve center business, and managing it has become increasingly complex. Why has the task of reaching the goals associated with ITSM been so difficult? Rapid technology growth is certainly one cause, but that is an excuse that has far too many hats hung from it already. Rapid technology growth contributed to the complexity of the issue but not necessarily the issue itself. The real issue behind ITSM adoption is really ungoverned organizational tension. This type of tension leads to a state of continuous requests for expediting of IT processes, uncontrolled escalation of project concerns, and the development of an adversarial mentality that pits business against IT in a struggle to deliver shareholder value. People become emotional, processes break down, and delays impact the business. But what if each IT process could be executed without any political or emotional motive? Consider this question as we examine the traditional mindset that leads to this situation. IT management has traditionally become frustrated with the relatively low degree of technical acumen, and regard for IT process governance, found in business units, while business units traditionally view IT constraints as obstacles to be circumvented rather than measures implemented to protect the bottom line. ITSM holds the promise to alleviate much of this tension by focusing attention on the business value of IT. Implementing ITSM, however, is nearly impossible when all the business and IT resources that need to come together to approach the delivery of ITSM are pitted against one another. Our teams can't work well together internally with an "us" vs. "them" attitude, and even if your IT and business unit relationships are strong, chances are that the teams are so overworked that putting enough time and effort towards making ITSM a success is completely out of the question. Simply stated, today's organizations cannot achieve a state of ITSM/ITIL best practices on their own without introducing ITPA tools. The resources required to do so would be cost prohibitive, which makes the use of an ITPA tool the only conceivable way to truly reach an optimized state of ITSM. ITPA holds the promise of releasing the pressure on IT resources by automating routine, not-soroutine, and even highly complex IT processes. As we will explore in the following sections, ITSM makes IT governance and ultimately IT service delivery much better. ITPA makes ITSM, among other things, much better by reducing human latency and enabling rapid process deployment. This will free your human elements to focus on the factors that matter most, such as delivering upon their unit goals and communicating with their partners while spending less time on fire drills and knee-jerk reactions. As we explore ITSM and ITIL, keep in mind that in order for ITSM to be successful, you need talented and thoughtful IT professionals building relationships and becoming active listeners to business needs. Your IT delivery executives and service delivery managers have a role to play as salespeople, as consultants, and, in matters of enterprise governance, as advocates for the lines of business they support. ITPA will free their time enough to fulfill those goals. Service Support is the discipline within ITIL, and ITSM as a whole, that can benefit the most from ITPA improvements, primarily because it is most concerned with day-to-day IT servicing of critical business functions. The Service Support discipline depends upon what ITIL refers to as a Single Point of Contact (SPOC) that provides the line of business with a single point of entry and exit for service support processes. Ensuring a SPOC exists for all IT concerns within your organization is likely to be your first major point of ITSM failure. Generally, the larger the organization, the more groups develop and evolve service desk routines to support the business. Centralizing these service desks can be a challenge that is complicated by different and disparate service desk software being used to perform this function. Outside contractors and vendors can further complicate the concern as many offer their own service desk function that organizations can leverage as their own. ITPA can offer a quick win in helping to consolidate service desk operations by orchestrating the integration between different service desk applications. For example, if your organization has two service desks that are being consolidated, rather than take on the entire administrative overhead of communicating the new service desk information to the organization during transition, re-training service desk personnel en masse, and establishing new reporting mechanisms, certain portions of service desk operations could be re-routed to the other service desk. Figure 3.1 illustrates, at a high level, the parallel approach and the three main tension points that develop: communication, retraining, and reporting. Figure 3.1: Pain points associated with consolidating service desk operations. 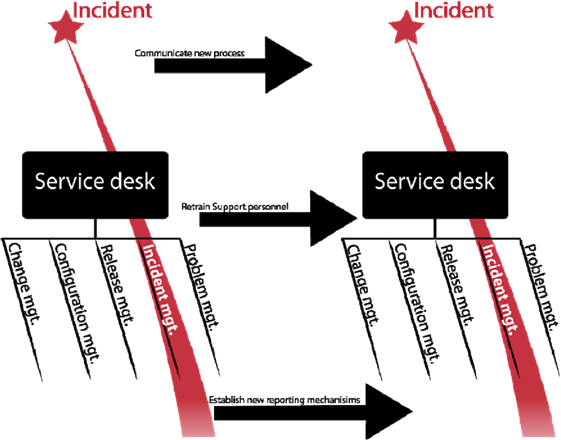 In Figure 3.2, however, an ITPA tool is being implemented that allows, in this example, incident management functions to be offloaded from one service desk to another. As training of service desk personnel proceeds, more and more service desk functions can be offloaded until the entire service desk is consolidated into a single solution. Communication of the final, consolidated service desk contact information can wait until the majority of service desk functions have been offloaded and the expanded service desk can accommodate the workload, minimizing miscommunication (read as confusion) and extraneous effort. 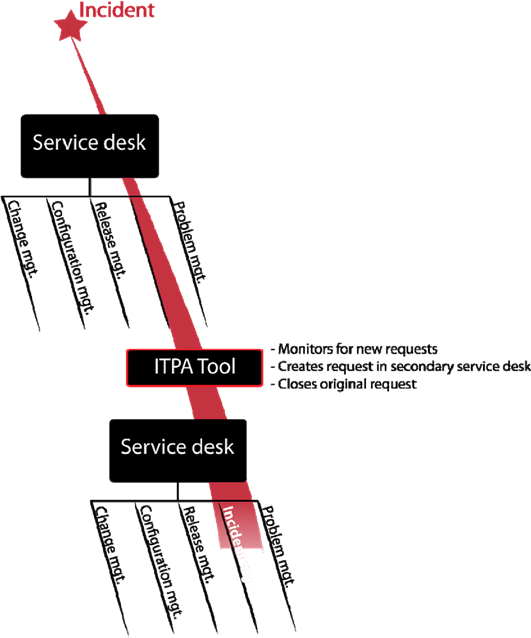 Figure 3.2: ITPA tool can be used to export incident management functions to a new service desk. The users still call into the same service desk number or enter data into the same service desk tool to create a ticket, but once created, an ITPA tool can be waiting to execute an orchestration process to bridge the two systems seamlessly. This kind of automation is just the tip of a very large ITPA spear. As we examine the five disciplines under service support in more detail, keep in mind that ITPA tools can deliver process automation extremely rapidly, and with their innate ability to interface with and leverage your pre-existing service desk and IT management applications, the sky is the limit as to what capabilities exist within your own infrastructure. The goal of incident management is to restore operations in the most expeditious manner possible while reducing further impacts stemming from the incident. The key point of pain in this statement stems from the word expeditious. For a process to be executed rapidly and successfully, it needs to possess a high degree of process maturity. Either this means that you have clearly documented and controlled procedures for manual IT processes or you have implemented some form of process automation already. ITPA delivers both quick and multigenerational process wins in this category in a variety of ways. First, ITPA tools are by their very nature much more rapid than human intervention, taking your mature service desk processes to new heights of speed and accuracy. In addition to the specific examples already provided in earlier chapters, ITPA tools can automate incident escalation and reporting into disparate systems. This capability is particularly helpful in organizations with multiple production notification systems or where compliance concerns drive a need for specific reporting based upon incident scope and impact, such as those with strong regulatory or compliance constraints. Figure 3.3: ITSM workflow example. The goal of problem management is to identify and resolve the root cause of incidents to prevent their reoccurrence. Problem management and the methods used throughout a problem life cycle are different from incident management methodologies. Problem management is conducted through the execution of a post-problem review (PPR), which is a process whose purpose is to review all the details associated with a particular incident, or set of incidents, to try to identify root cause. This root cause analysis of an incident can be a labor-intense process. As problem managers work to isolate and identify the different contributing factors to the problem, they often need to perform a great deal of research using a variety IT tools. Incident management systems are usually just the beginning. More troublesome are the research points that lead outside of incident reporting itself and into the realm of IT delivery. Network trace logs, server logs, and mainframe system logs may all need to be accessed, cross-referenced by time code, and sorted (just to name a few). Automating the research and organization of this type of information is nearly impossible outside of the construct of an ITPA tool. By integrating with existing IT applications, the depth of research that can be performed using an ITPA tool is nearly limitless. Problem managers can quickly connect new research processes to multiple systems with your IT infrastructure and compile detailed data organized by time/date stamp with even the most rudimentary process knowledge and no programming or macro coding required. Change management is the ITIL discipline focused on ensuring standardized procedures are used for the efficient handling of all changes. Requesting, authorizing, governing, and implementing these changes requires many processes, each of which can benefit quickly from the implementation of an ITPA tool. Through a traditional semi-automated change management process, this task could take hours or even days. An ITPA tool could be leveraged in this situation to monitor change requests from the service desk application, use the information contained within that request to provision a new email account, assign the appropriate rights, and communicate the completion all, quite literally, in a matter of seconds. Specific audit functions and error handling could also be included so that names that currently match existing mailboxes don't error out while trying to create a duplicate account, and process steps could also be added to update the existing request and requestor along the way so that if a flag is raised regarding a problem with an account, the requestor and more importantly the email team are both promptly informed of any delays that require management attention. Taking this example a step further, an ITPA tool could automate the entire user creation process including Active Directory (AD) account, mainframe accounts, application permissions, email accounts, and welcome emails from human resources explaining important policies or procedures. An email could even be sent automatically to members of the new associate's team, letting them know his or her new email address automatically. Even greater value in change management can be found on the opposite end of this example—user account deletion—which we will cover later in this chapter. Configuration management is the ITIL discipline intended to ensure standardized procedures are in place for the handling of all configuration items (CI) with a Configuration Management Database (CMDB). As you'll recall from previous chapters, configuration management is an important discipline because of the critical role the CMDB plays in the success of the lights out data center. ITPA tools contribute greatly to the management of CIs by automating the processes that add, alter, and delete CI information. For example, if an organization has multiple systems of record for computer hardware asset information, an ITPA tool could be use to establish a process that would gather information from one system, combine it with information from another system, and integrate both into a new CI in a CMDB. Potential for ITPA use in configuration management varies greatly by organizational need and stage of configuration management adoption. Due to their flexibility, however, ITPA tools can contribute greatly to configuration management within any organization. The goal of release management is to ensure rapid and successful distribution of software to the production environment and that distributions delivered do not adversely affect production. This is typically achieved through rigorous process disciplines surrounding the deployment of software distribution packages and software distribution applications that enable the precise timing and deployment of software packages. ITPA tools contribute to release management success by assisting in the automation of deployment solutions, monitoring and auditing deployment status, and reporting. Virtualization has brought with it a whole new definition of IT efficiency. Prior to the virtualization revolution, far too many organizations were spending far too much money on dedicated hardware and software solutions. Sadly, much of this was the result of what was, at the time, sound IT strategy. The world of IT management lived in a state founded upon "don't put all of you eggs in one basket" logic that forced the segregation of critical IT systems. Today, however, we have learned that we can put all our eggs into one basket provided, of course, that the basket itself is a fortified, compartmentalized, and meticulously controlled basket. The sound strategy of segregation at the server level has evolved to compartmentalization within a single server infrastructure. Virtualization alone may be one of the most cost-saving, intelligently designed server management constructs ever conceived. It allows IT to invest in hardware infrastructure prior to knowing the exacting requirements of each project, saving time and money, and it enables rapid provisioning of sever resources when needed. ITSM can provide process guidance to make it all work smoothly, but even the most well-organized and meticulously documented processes can't accommodate for human error. When humans do make mistakes, one of the biggest benefits of virtualization, rapid provisioning, can present a big risk as those mistake are deployed rapidly. ITPA tools can help you keep a good eye on your basket by automating the monitoring process and even executing a few diagnostic and recovery routines along the way. Figure 3.4 illustrates the monitoring of a virtual environment for errors and the execution of multiple diagnostics to help determine root cause. Figure 3.4: ITPA tolls monitoring a virtual environment for errors. Beginning at the first stage in Figure 3.4, an ITPA tool can watch your monitoring software for indications of performance errors, and when they occur, create a new incident (in your own incident management software) to record the problem. From this point, the ITPA tool may execute a query to determine root cause, whether through Virtual Machine (VM) diagnostics or through ESX diagnostics (depending upon which system is used in your organization). Finally, the ITPA solution can log the output and update the trouble ticket with results. The benefits continue: Perhaps you need to notify a VM engineer or vendor when errors occur. If so, a process can be established off of any of the previous steps to notify them via email, pager, or through virtually any software you currently use to manage these notifications. ITPA tools are platform- and software-agnostic and are designed to deliver fully automated IT processes regardless of what systems you currently leverage to get the job done. All IT organizations are continually challenged to do more with less. Through ITPA tools, this goal can actually be realized. In nearly as little time as it takes to define the consolidation process, ITPA tools can orchestrate end-to-end data or server consolidation projects. For example, ITPA solutions can extract data from event monitoring and service desk tools and consolidate events into a central system. Migration of data can expedite the elimination of redundant systems as well as correlate events between systems so that the data that resides in multiple places is synchronized. ITPA solutions also offer a highly efficient method to migrate physical configurations to virtual systems, including moving data from multiple systems into a new system solution and monitoring for a new server request to provisioning the applications making the provisioning pipeline for virtual servers tightly oriented towards high-speed execution. Figure 3.5: Using an ITPA tool to orchestrate an end-to-end physical server to virtual server migration. As Figure 3.5 shows, this particular ITPA process is monitoring an asset database (CMDB) for a new server request. Once one is received, the ITPA tool can, using information provided in the change management record, interface with your provisioning server software to create a new virtual server. Gathered configuration and application data is applied to the virtual server, while the physical windows and Unix servers are shut down. Once the physical servers are removed, the virtual server is started, and an audit is run to ensure the configuration is compliant. From there, the asset database is updated and the originating ticket to migrate the server is updated and closed. Security must be executed flawlessly. Unlike a single character mistake in a virtualization or provisioning process, which may result in a misnaming of a server or at worst a failure that will quickly be realized in production, a single character flaw in a security process can spell disaster on a broader scale quite rapidly. This isn't to say that security is any more or less important than any other IT process discipline; it is, however, one whose management focus on the granular details and flawless execution gain some notoriety and which can benefit greatly from flawless process execution. Unlike manual, human-executed processes, automated IT processes don't make mistakes in the actual process execution. Provided the process itself is sound, ITPA tools can be leveraged to streamline and expedite security, or virtually any other IT process, and deliver consistent results. Consider the process associated with removing a user from the organization. This will often involve changes in a variety of IT systems from AD, mainframe access, and Exchange, just to name a few. Figure 3.6 illustrates how an ITPA tool can be used to set up a process that will monitor for requests for user removal, acknowledge the change request, disable the account in AD, archive the user's mailbox, delete the mail account, and close the request. The process can even include a step to send an email notification once complete. The best part is that the entire process, from the time a manager initiates a request to the time the request is closed, takes mere seconds rather than the hours or days associated with a manual process, saving your organization time which equates to money, and reduces the overall IT risk. Figure 3.6: An ITPA security process for user removal. Taking steps to improve time to market, the provisioning process and automation of mature provisioning processes can deliver, pound for pound, the greatest ROI to line of business project timelines. As you may recall, we touched slightly on the provisioning process in Chapter 1. Explaining this process in a bit more detail, an ITPA tool can be leveraged to automate provisioning processes between service desk applications, provisioning applications, auditing functions, and release management. For example, in Figure 3.7, an ITPA tool is being used to monitor a service desk application for a change request and then executing a pre-defined ITPA process to configure server settings (based upon the change request), audit settings, create a package for distribution, and deploy the new system. End to end, this process, once automated, will take a fraction of the time associated with semi-automated tasks. Figure 3.7: Provisioning a server. Leveraging ITPA tools to provision servers within your organization will reduce the time to deliver of IT services which, in turn, will reduce time to market for operational products and services. There's no doubt that ITPA tools can provide vastly shortened delivery times, but they can also help you reduce the complexity of your IT infrastructure. A major theme of this chapter has been pain in terms of time and cost. By choosing to automate only those processes that lead to the greatest IT business benefit, such as virtualization and provisioning of virtual environments, the disparity in project time associated with building a virtual environment vs. a dedicated server environment will be a solid leveraging point to drive business use towards the virtual infrastructure. If a virtual environment can be provisioned and delivered 100 times faster than a dedicated environment, line of business partners will have a strong financial motivator to see their projects leverage the virtual infrastructure. The processes supporting disaster recovery may be an area within your organization in which you can gain the most traction for ITPA. ITPA tools can be leveraged within disaster recovery to dramatically reduce recovery times. Figure 3.8 illustrates an example ITPA tool process that monitors for disaster recovery messages, invokes the restore process, runs various verification steps, and provides results to management. The entire process is orchestrated to run automatically without human intervention, so the only limitations on how fast an environment can recover are those of the technology infrastructure. Figure 3.8: An example automated disaster recovery process. When considering areas for improvement within your IT organization, the places we most often start are those that provide us with the greatest sources of pain. Manual, high-impact, highvolume tasks are often at the center of IT attention (and tension), as these tasks are the most likely to raise the highest visibility when they fail. Incident and problem management tasks, software and server provisioning, security, and disaster recovery solutions can all benefit from ITPA. Manual tasks are human dependant, error prone, difficult to control, and costly. In contrast automated processes are faster, more accurate, easier to control, and will enable your organization to reach peak efficiency in IT operations. As we learned in Chapter 2, manual tasks are typically representative of the lowest degree of process maturity and generally are dependent upon experiential knowledge to succeed. Even the most skilled and diligent employees sometimes make mistakes. Any change or modification to the normal personnel or process and a high degree of error can quickly be introduced. For your high-impact, high-volume tasks, consider this question: Is it really fair to place a single person in the position to impact production through a single action or inaction? Operations personnel do need be competent and diligent, but at a certain threshold of risk, there comes a point where management accountability needs to come into play and limit the amount of influence an individual can exercise over operations. These are ideal points for ITPA tools to be leveraged to reduce risk. To reduce your delivery and support time, increase the number of transactions per FTE, and establish truly clear definitions of service levels, ITPA tools must come into play. And in doing so, they will help you avoid abnormal SLA requirements while reducing overhead and increasing operational efficiency. These tools deliver the speed, accuracy, efficiency, and simplicity necessary to meet your goals and as such will reduce your overall IT "pain."